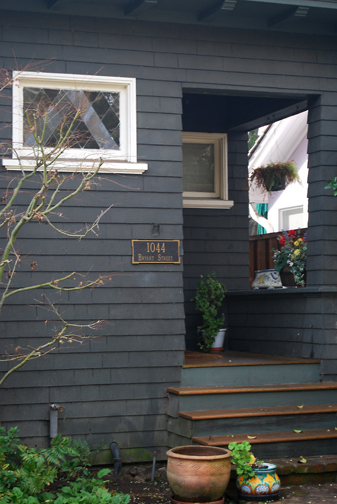 The old adage “ you can’t judge a book by its cover,” definitely applies to the house at 1044 Bryant Street. 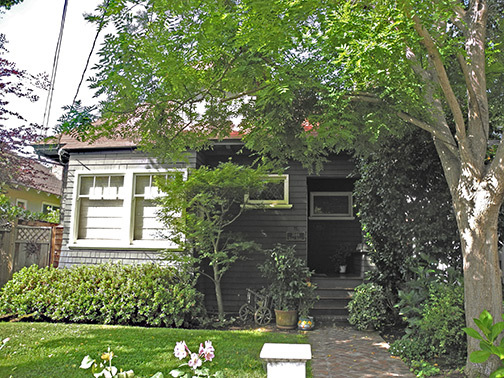 Its simplicity belies the fact that it was home to several generations of Palo Alto’s most fascinating residents. John and Agnes Varian were born and raised in Ireland, where they were members of the Theosophical Society of Dublin. Many Irish radicals and intellectuals, such as William Butler Yeats were attracted to Theosophy as a cosmic solution to the political and cultural problems of Ireland bred by England’s colonization. Theosophy blends Eastern and Western religious beliefs and studies humanity’s relationship to God and with all life. In 1894, the Varians immigrated to Syracuse, New York where they joined The Temple of the People, a theosophical group founded by William Dower. In 1903, the group relocated to Halcyon, California. John and Agnes and their young sons, Russell and Sigurd also moved west, but they chose Palo Alto. The Varians’ 1,060 square foot house was affordable for a family of modest means. John, a poet, amateur musician and expert in Irish folklore, was not wealthy. 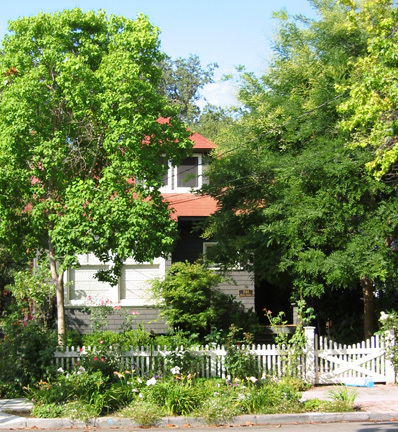 The one and 1/2 story house with its hipped–roof was originally brown shingled. Gable–roofed dormers at the front and rear provided four bedrooms. The façade of the house has a projecting bay with two stationary windows whose upper third is three–paned. A recessed entry porch at the right led to a parlor which became an informal neighborhood school for the Varians’ literary and theosophical teachings. The family even managed to camp out in the back yard of the small 35 x 105 foot lot. It is said that John and his sons were doing just that on the night of the 1906 earthquake: “they woke up to see many a modest lady running down the street in her nightie.” What the Varians lacked in wealth, they made up for in a creative, loving, humorous and adventurous spirit. All the boys exhibited an early fascination with electricity which sometimes resulted in electrical outlets being attached to bed springs and door knobs in order to give unsuspecting visitors minor electric shocks. The intellectual atmosphere of the Varian household compensated for the dyslexia which affected Russell Varian (1898–1959) and Sigurd Varian (1901–1961) in school. Russell, through “sheer force of will”, earned a B.A. and M.A. in physics from Stanford University by 1927. He was rejected for Stanford’s Ph.D. program because of his weak math and reading skills. Sigurd, the more outgoing of the brothers, attended Cal Poly but, because of boredom and periodic bouts of illness, never graduated. He became a Pan Am pilot while Russell held a succession of engineering jobs after graduation. In 1935, aware of the hazards of flying, Sigurd suggested that Russell and he invent a radio–based technology using microwaves that could detect airplanes at night or in clouds. Quitting their jobs, they set up a lab at Halcyon, where their parents had moved, to invent a device for determining the location and direction of an airplane. Their inadequate lab prompted Russell to contact his college roommate, William Hansen, now teaching at Stanford. Hansen introduced the brothers to David Webster, head of the physics department. Webster hired them in 1936 to work at the University in exchange for lab space, $100 a year for supplies and an agreement that Stanford University would receive half the royalties from any patents. The following year, with Russell’s design and Sigurd’s prototype, they developed the klystron, a specialized linear–beam vacuum tube used to amplify high radio frequencies. The Varian’s invention, introduced in 1939 in The Journal of Physics, was immediately adapted by the British for use in radar stations and contributed to the defeat of the Luftwaffe in the summer of 1940. Ultimately, the klystron became a critical component in telecommunications, particle accelerators and microwave technologies. The brothers worked for Sperry Gyroscope during the war but returned west in 1948 to found Varian Associates. William Hansen provided their start up funds by mortgaging his home. Not only was their company the first to lease space in the new Stanford Industrial Park but it also pioneered policies of profit–sharing, stock–ownership, insurance, and retirement plans for employees. Varian Associates reflected Russell and Sigurd’s political progressivism. Russell, an ardent conservationist and hiker, was scouting land for Alaska’s new national parks, when he died of a heart attack in 1959. Sigurd purchased land with the idea of establishing cooperative housing for Varian workers; it became the town of Ladera. In 1961, Sigurd, after losing his way in the darkness, crashed his private plane into the Pacific Ocean while flying from Guadalajara to Puerto Vallarta. One fourth of his estate went to fund a hospital in Vallarta.